One of the greatest fallacies of the ‘modern world’ is the notion of ‘progress’. We imagine the entirety of history as culminating in a Darwinian march toward Western Civilisation. We think of our ‘progressive values’ of liberalism, self-indulgence, materialism, universal human rights, multiculturalism… to be uniquely ‘enlightened’. What we are going through is nothing new. Civilisations have gone through the same processes over millennia, recorded by the sages of Greece, Rome, Egypt, Arabia, Aztec America, India - the features that are most celebrated today as the epitome of ‘progress’ have been recorded throughout history as the symptoms of a terminally ill civilisation.Our ‘progressive’ academics and politicians assure us that never has there been such a civilisation as ‘enlightened’ as ours, and U.S. strategists perversely tell us that the West has reached the pinnacle of human history - a healthy blessing to be imparted to every corner of the world, whether by Hollywood or by bombs.In The Decline and Fall of Civilisations Dr. Kerry Bolton surveys the major civilisations of the past, their traditions, myths and religions, to discover how ‘races’ and ethnic groups are formed, each with their own ‘souls’ that are expressed in a myriad of ways. 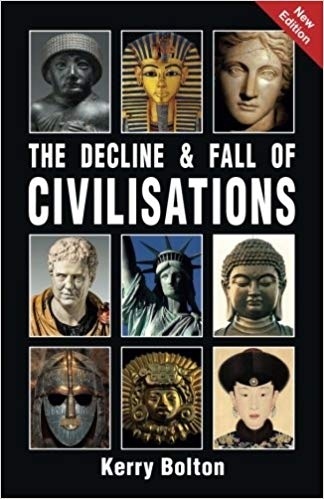 In addition Dr Bolton also cites their political and religious leaders, their philosophers, and sages, who at the pinnacle of material wealth, hedonism, and decadence could foresee the end of their own civilisation. Dr Bolton discards materialistic assumptions about ‘race’ and history from both ‘Left’ and Right’, but concludes that there might still exist a culture that is yet to fulfil its destiny while re-invigorating whatever remains of value in the West.